Finally the time was ripe for me to try my hand at cupcakes, I had all the ingredients and all the tools and spent a lovely Sunday afternoon making and decorating. I see the attraction and I can very easily see myself investing in a full kit of tools for sugarcraft. Must be careful. I spotted the inspiration for these here. Sadly no recipes were provided, so I had to find these elsewhere. For the basic muffins, I chose a recipe from the BBC. Pre-heat the oven to 180 degrees C and line a muffin tin with paper cases of 5 cm diameter at the bottom. Or a flat baking sheet, but place each paper case into 2 aluminium cases, to ensure they don't sprawl out sideways, but bake upwards. Mix together flour, cocoa, bicarbonate of soda and salt well, then sift to get airy and remove lumps and set aside. In a glass, mix together the instant coffee and water. Whisk together the butter and sugar until well combined. Then add the eggs, one at a time and whisk in well. Add the coffee, followed by the vanilla extract and half of the dry mixture. Pour in the milk and incorporate and add the remainder of the dry mixture. The batter should be quite runny and feel and taste a bit like Angel Delight. Pour into the paper cases, up to about 1 cm from the top edge. Bake in the middle of the oven for 20 - 25 minutes, check with a toothpick after 20 minutes for readiness - the toothpick should come out clean. Take out and let cool for 10 - 25 minutes, then remove to a wire rack and allow to cool completely. They will still remain fairly soft. One thing I did decide to skimp on was the cookies themselves. I decided to buy ready ones and this proved to be difficult in Sweden, at least in the shops where I looked. I bought what seemed to come nearest, but as it turned out, it didn't work either. Then the next new thing of the day - buttercream. Again I picked a BBC recipe for this and I made 2 batches, one on 140 g and one on 150 g (the remainder of the butter as it happened). Carefully stir together butter and icing sugar with a fork/spoon/spatula. Add the milk when almost all of the sugar has been incorporated and add the colouring until the right hue is achieved. Keep covered if not using straight away and even refrigerate if not using on the same day. It will need to be brought up to room temperature and stirred to soften up again then. I had trouble finding white chocolate buttons for the eyes in the shops, so I got giant Milkybar buttons, but there are specialist shops that do sell these in Sweden. For colour, I used 3 tiny tubes of liquid blue colour for egg painting. I think each was about 3 ml or so. I ended up with turquoise, so I also added a pill-sized capsule of powdered egg paint, which did the trick. All these purchased in Bulgaria and were so good, that I'll buy more at the next opportunity. I suspect regular food colour will do just as well. I coloured in the smaller of the two batches of buttercream. The bigger one, I left as was. For the pupils, I used black icing from a tube left over from the gingersnap decorations a few weeks ago. I first used about a tbsp of the uncoloured buttercream to create a mound on each muffin. Also I noticed that the buttercream wasn't too keen on sticking to the muffin surface, so this will help in getting the blue stuff to stick. Careful, though, it's tasty but very unhealthy, so don't overdo it! Then, cut a slot for the cookie and stick it into the muffin. No, no, no. This deformed the muffin. Way too big, way too thick. Anyway, on with the piping. Start at the outer edge and work around in a spiral into the middle, working around the cookie of course. Then, take two white chocolate buttons, squirt out two blobs for the pupils and stick the eyes into the muffin. Gah, his jaw is about to fall out, no wonder he's cross-eyed! What to do, what to do? Try using some pink chocolate buttons? Ha, they look a bit like Grover. As my Mum was milling around trying to see if she could dig out some long forgotten biscuits of a suitable size and thickness, it struck me - wafers! Mum quickly got out a small cookie cutter and went to work on the wafers and lo and behold, they were perfect - the diameter was about 3 cm and thickness was 3 mm. Most of the 13 cupcakes ended up with a nice thin wafer in their mouth. The buttercream hardened up pretty quickly. I had about 1 dl left over from the blue buttercream and about 0.5 dl of the uncoloured one. Around this point, my Dad asked if it would be possible to make Kermit, Statler & Waldorf, which are his favourites. Probably it is possible, they aren't as fuzzy, so I'd need to use a different technique for them. A project for the future for sure. The Sunday finished rather late, but was extremely satisfying. 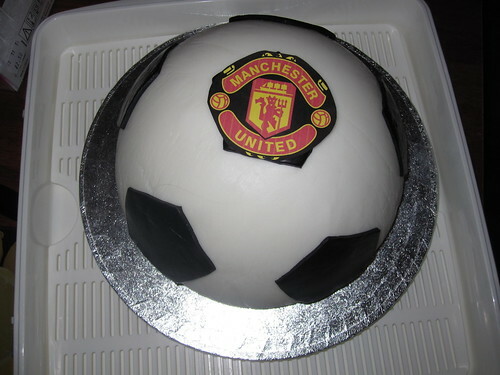 It is once again time for Falbala's birthday party and this year she asked for a football themed cake. She does play football among other sports and supports ManU. This also has the added benefit of annoying most of the men in the family as they all like other teams. For me, it was an opportunity to try out a principle that I'd thought out for the next time I was going to make Princess cake. There is a hidden away little cookery shop in our village that has a rather good stock of sugarcraft supplies, among others ready to roll fondant icing in various colours, so I bought white, black, red and yellow. I also bought liquid yellow colouring too, without any definitive plan. I also spotted birthday candles in the shape of tiny footballs and bought them as well. Well home, I made my way to the ManU website to look for a badge and found a decent one. I'd not realised that it is actually quite complicated and still didn't have a clue on how I would make it, but I printed it out to maybe trace it out somehow. But back to the cake. For the base, I used the recipe from Lou's swimming pool cake. I wasn't entirely sure of how much I would need. I remember Lou's cake ended up massive, and here I would only need a small version of it, but I still ended up making a double batch, just to be on the safe side. Since I have two springform cake tins, one 20 cm diameter, the other 25, I used both. The large one, I buttered and floured and then poured in a thin layer of cake mixture, as thin as I could make it. The idea was that it would be no more than 2 cm after baking. The rest went into the small cake tin (also buttered and floured). Luckily both tins fitted together into the oven, though of course the large thin one had to come out first. I did have some left over cake mixture, so I also made 7 cupcakes, but I over-baked them a bit. In the mean time, I placed the white icing (500g) between two pieces of clingfilm and rolled it out to about 3 mm thickness and as circular as possible to about 30 cm diameter. No extra icing sugar needed for dusting. Unfortunately the clingfilm did end up with creases here and there, which transferred to the icing, but on the whole, I was pretty pleased. 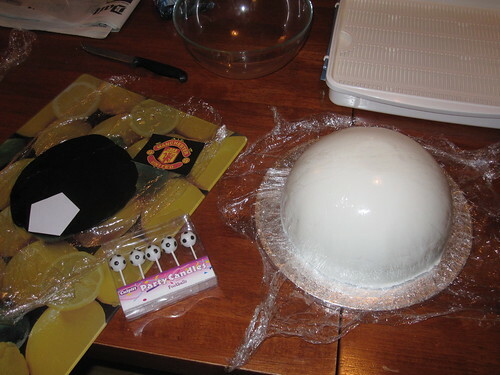 I then carefully pushed the icing into my semi-spherical bowl (remember my Stoichkov cake?) and when it was in, I removed the top layer of clingfilm. Next, I fitted in the large thin circle of cake. Unfortunately I should have timed things better so that the cake was still soft and pliable, but I didn't and so it was solid and cracked, so I ended up filling the gaps here and there. 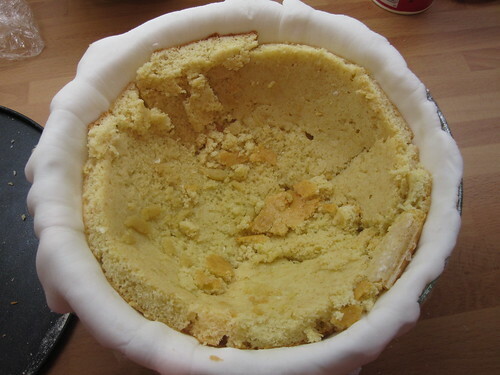 As I was fitting the cake in, I cut off the edges as they were particularly hard. This was a good idea, and I even made sure that the cake ended a couple of cm inside the bowl so that when I'd put in the bottom of the cake, it would fit into the bowl. Next I spread a thin layer of strawberry jam onto the cake and filled up with whipped cream, which I'd flavoured with a little vanilla and sugar, nothing out of the ordinary at all. For the bottom of the cake, I cut one 2 cm thick layer from the smaller cake that I made. It fitted rather like a lid. I then wrapped with clingfilm and put in the fridge. Back to the computer to look for pictures of footballs. Yes, the new ones are made up of various pieces of leather, the older ones were made up of white hexagons and black pentagons. How do you draw a regular pentagon? Google, google, corr, blimey, compass and whatnot. No, no, no. But the internal angle of a regular pentagon is 108 degrees, and luckily I managed to find a protractor and made myself a regular pentagon from a piece of paper, much easier. OK, maths lesson over. The next day, on the actual birthday, I put the cake together. This means turning it over and out of the bowl, a very careful activity, but with a little patience the cake came out quite nicely. There were some creases on it from the clingfilm, I tried to smooth them a bit with a dough scraper, but it didn't really work. I'll need to look into this further. Again, using to pieces of clingfilm, I rolled out some of the black fondant icing and using my paper regular pentagon, I cut out 6 and pressed them carefully against the white icing on the cake, one on top and 5 around the side. 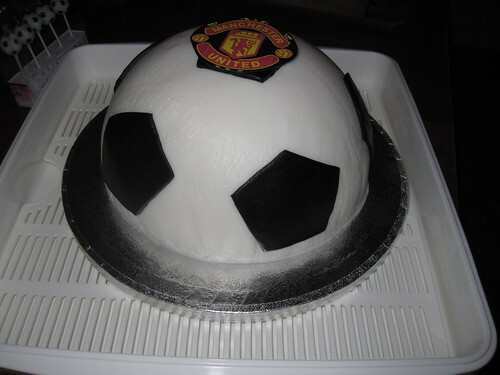 At this point I had come to realise that I would not be able to create a ManU badge in sugar, so cut out the one I had printed out and placed on the top of the cake as well. Very lame, I know, but I'd just run out of ideas. But it turned out rather nice on the whole. And proved that my idea of constructing a cake upside-down in a mould works. I also ended up with two more layers from the smaller cake I baked. They are now in the freezer for emergency situations. A thing to keep in mind - coloured icing bleeds through paper and towards the end of the birthday party, the ManU badge was barely visible. Must remember to put greaseproof paper inbetween.